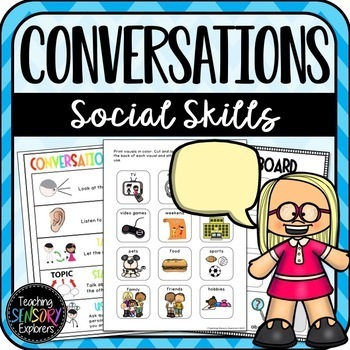 This listing is designed to develop students conversation skills. 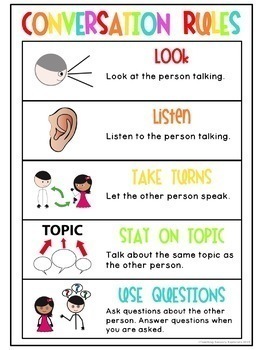 Often students with autism struggle with conversation skills such as taking turns in conversation, listening, asking a range of wh questions, using appropriate volume and staying on topic. These visuals will allow you to teach the required skills. This product is suitable for early intervention, special Education and students with autism. Topic Board with visuals to assist students in choosing a topic to talk about with a peer or teacher. Includes 2 designs of boards and the visuals: TV, movies, music, video games, weekend, school, pets. food, sports, family, friends, hobbies, holidays, toys, birthdays and transport. Visuals are made in standard PECS size. Sentence strips: "I want to talk about blank". Words are supported with visuals. Conversation rules poster in color and black and white. Safe and unsafe topics to talk about at school. Mini posters. Visuals: too loud, too quite, wait, my turn, stay on topic and talking. In two different sizes. Voice gauge (loud, just right, quite). 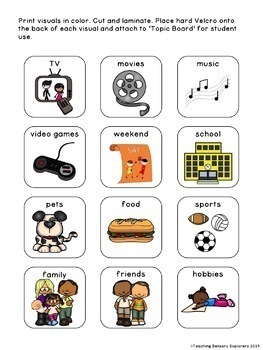 Two versions with clip art for younger and older students. Taking Turns Visual aid. Students tick the boxes as they have a turn and as they listen to a peer. I can stay on track rewards chart (train theme). 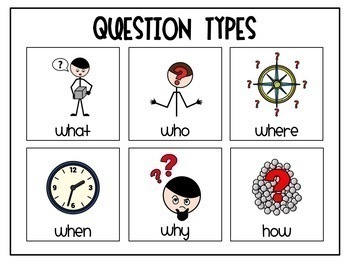 Give students a train visual every time they comment or ask a question that is on topic. All pages require laminating and some require Velcro. Click here to follow me and be the first to know about my new discounts, freebies and product launches.